Buzara is one of the basic ways of preparing seafood (such as shrimps, seashells, scampi) using extra virgin olive oil, garlic, parsley, white vine, rosemary; all these flavors should be well balanced with each other in this mouthwatering meal. As you can see from the title I got this recipe from Nona ( grandma) Vedrana, mother of my lovely friend Koraljka. Nona Vedrana is committed to Vranjic culinary tradition and she is very proud of it. ( Vranjic is small picturesque place near Split). Nona Vedrana is excellent cook by herself with long experience. For me it is honor and pleasure to present her way of preparing BUZARA. Dalmatian cuisine is dominated by buzara, brudet, gregada…traditional ways of preparing fish and seafood. It can be white or red Buzara, only tomato makes a difference. Each recipe is slightly deferent from the other, depending on the the area where it comes from and of course, each cook has its own little secret due to its preparation. In Buzara none Vedrane dagnje (mussels) should be just quickly done, not over cooked.That’s what make this delicious meal tasty and healthy at the same time. Good news for all beginners: it is very simple process! The most important thing to remember is that you need extra fresh mussels.I am buying it on Split’s fish market which is the dream-come-true destination for all of us fish and seafood lovers. Here I face the biggest challenge …what to pick up today as the offer is extraordinary. Fresh mussels should be tightly closed. 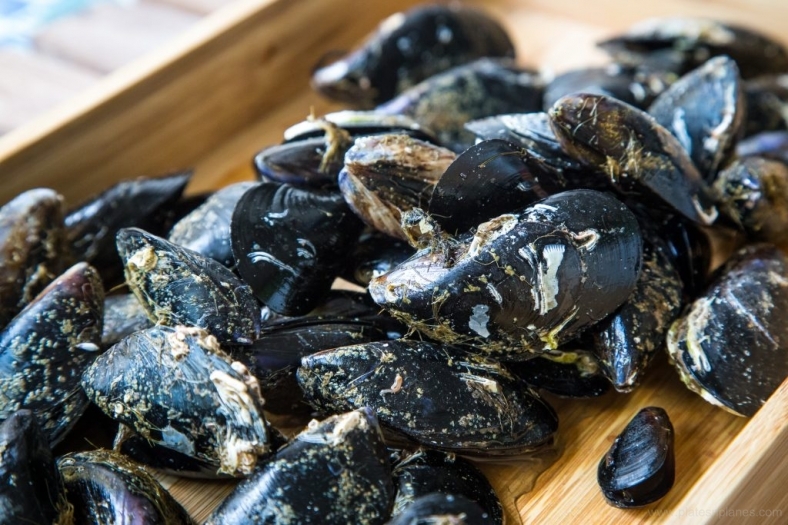 Wash the mussels under the cold water ( not warm water, otherwise they could open).Than drain them and put in a bowl, cover it and keep in refrigerator until you are preparing the base of Buzara. Prepare a big, deep pan. Put into it olive oil and heat it on law fire, than add garlic and stir it for few minutes until it turns to goldish. Than add parsley and rosemary and stir again for just few minutes. Finally add mussels. ( drain it again before you put it in the pan ). Stir well, to combine all ingredients together evenly. Cover it and cook for next 5 minutes. Stir it occasionally and when they start to open , add a wine and stir again. Let Buzara boil for a while( just few minutes) and than add bread crumbs, stir it altogether for 2-3minutes. Bread crumbs will help sauce to be thick. Finally shake the pot, and buzara is ready. First put in a plate a piece of corn bread than spread a buzara over it. Now you have complete meal, you just need salad and glass of white vine. You can also serve it with polenta or noodles.